MIAMI — Politicians are being targeted in Mexico ahead of the country’s July elections, and the latest murder was caught on surveillance video. 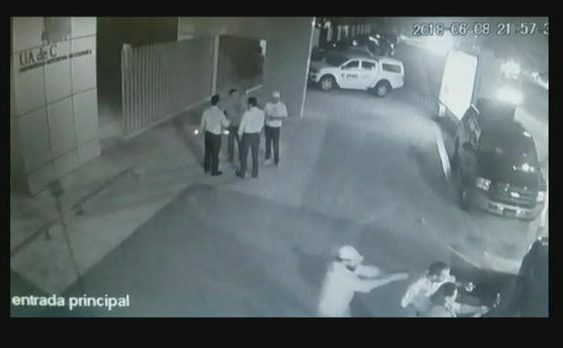 The footage shows Mexican congressional candidate Fernando Puron posing for a selfie with a supporter after a campaign debate last Friday, when a man walks up from behind, raises a gun and fires at the back of his head. Puron was running on an anti-cartel platform which made him a target in Piedras Negras, which borders Texas. He is now one of 113 candidates and politicians who have been murdered in Mexico just since last September, when the election cycle started. Fifty relatives have also been killed and 132 politicians, mostly at the local level, have been threatened. CBS News spoke to the current mayor of Piedras Negras, Sonia Villarreal, who says her life was threatened just one day earlier. When asked if she was fearing the cartels, she said “no,” but she did put her re-election bid on hold to focus on the investigation into Puron’s death. The wave of violence comes as 15,000 candidates run for the most open government positions Mexico has ever had. Drug cartels and organized criminals are trying to silence those who would threaten their hold on lucrative smuggling routes to the world’s number one consumer of illegal drugs, the U.S. But it’s not just politicians being targeted. Last summer, for “CBSN: On Assignment,” CBS News reported Mexico had become the most dangerous country in the western hemisphere for reporters. We spoke with Carlos Lauria, who has been pushing for better security. “It’s impeding the possibility of Mexicans to engage in a public debate of the issues that are affecting the daily lives of Mexicans,” Lauria said. meanwhile, Villarreal plans to start campaigning again, but with increased security.